John is president and CEO of Creative Leaps International, The Learning Arts, Icarus Musicworks and Associated Solo Artists. Educated at Rensselaer Polytechnic Institute (biology & physics), the State University of New York at Albany (learning theory), and the Manhattan and Juilliard Schools of Music (music & voice), Cimino holds a uniquely interdisciplinary perspective and works across multiple disciplines dedicated to learning and human development. He serves as a consultant and advisor to universities engaged in interdisciplinary reorganization with a primary focus on creativity, leadership, and arts-mediated approaches to pedagogy. 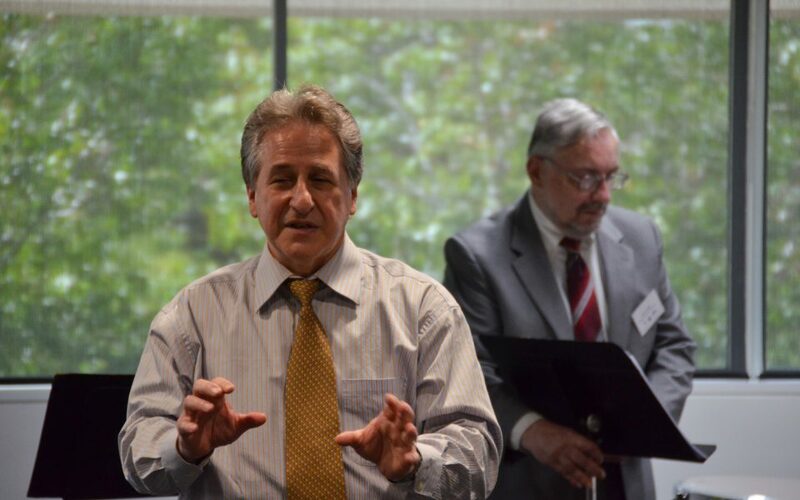 As a consultant and champion of the arts in business and professional life, Cimino has brought his "Concerts of Ideas" and other innovative programs into projects of the White House, the Center for Creative Leadership, the Council for Excellence in Government, the District of Columbia's Center for Excellence in Municipal Management, and the leadership training programs of dozens of Fortune 500 companies including GE, IBM, Pfizer, The World Bank, Macquarie Banking and Finance, The Bank of Montreal, McDonnell Douglas, the SC Johnson Company, Starbucks Coffee Company as well as to numerous universities and professional organizations worldwide. Special projects include presentations before the Global Leadership Forum (Istanbul), the International Organization Development Association (Guanajuato), The European Summit on the Arts and Business (Castle Borl, Slovenia), the Organizational Behavior Teaching Society (Irvine, Ca), the Association for Supervision and Curriculum Development (Alexandria, VA), the Association for Managers of Innovation and The International Creativity and Innovation Networking Conferences (Greensboro, NC), and the Middle East HR and Leadership Conference (Dubai, UAE), among many others. Current projects include “The 50+20 Year Project: Business Education in the Coming Decades” in partnership with the Globally Responsible Leadership Initiative, the World Business School Council for Sustainable Business, and the United Nations-supported initiative “Principles for Responsible Management Education; the North African Partnership for Economic Opportunity (Aspen Institute, US State Department); the University Summit on Interdisciplinary Research and Education at the Beckman Institute for Advanced Science and Technology, University of Illinois, and a special project with Queensland University of Technology in Brisbane, Australia, purposed to introduce and apply the Creative Leaps methodology with leaders in academia, business and government across the country and into the Outback. Cimino is also a performing artist and composer and winner of more than 20 national and international awards as an operatic and concert artist, performing to acclaim throughout Europe and the USA including productions of LA BOHEME (Academy of Music, Philadelphia, opposite tenor Luciano Pavarotti, LUISA MILLER (International Verdi Festival of Busetto, Italy, opposite tenor Carlo Bergonzi), and MADAMA BUTTERFLY (New Jersey State Opera, opposite soprano Anna Moffo). As a teaching artist with more than 40 years in the field, Cimino has served communities in upwards of 30 states, working with children and their teachers, training school leaders, and grooming the next generation of teaching artists. Cimino has also served as Education and Artistic Director for the Tenth Anniversary Tribute to the Search and Rescue Community of 9/11, as advisor to the faculty of Chicago’s Institute for Arts Entrepreneurship, and as Education Advisor for the Artists for Amnesty Project of Amnesty International USA. Humanitarian projects include workshops and performances for the Police, Fire and Rescue Teams at Ground Zero in the weeks following 9/11; resilience retreats for the staff and volunteers of the Southeast Louisiana Chapter of the American Red Cross in the wake of Hurricane Katrina; and programs for staff and volunteers of the Aids Resources Coordination Committee of New York State.